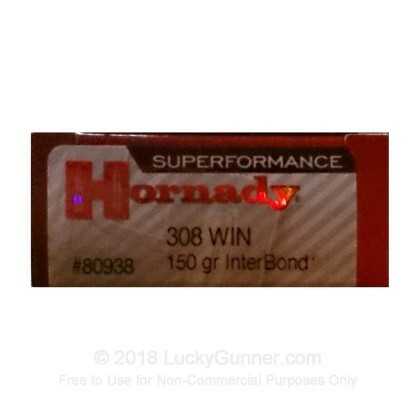 This .308 Winchester ammunition from Hornady's Superformance series uses advanced propellants to achieve superior muzzle velocity and accuracy without increasing felt recoil, noise, or fouling. Although somewhat costlier than traditional ammo, these cartridges deliver impressive performance against deer and other midsize game and increase your chances of achieving a quick, clean kill. Each cartridge in this box of 20 fires a 150 grain polymer tipped hollow point bullet at a high muzzle velocity of 3,000 feet per second. This increased velocity results in reduced temperature sensitivity, flatter trajectories, and better terminal effect. Superformance ammo is just one of Hornady's many innovations in ammunition engineering. The company was founded in the 1940s as a bullet manufacturer, but has achieved great success in the loaded cartridge market as well. Hornady ammo is used for hunting, self-defense, law enforcement, and target shooting. We don't have any reviews yet for this particular .308 (7.62X51) ammo from Hornady. If you'd like to be the first to review this particular .308 (7.62X51) ammo from Hornady, fill out the form below.